Liz opens her Little Black Book of Party Secrets…. Wednesday September 6, 2017 – it is all happening in Birmingham! 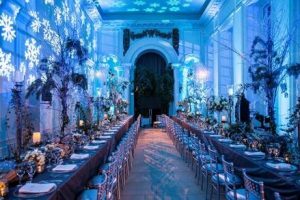 Liz will be delving once more into her little black book of party secrets, to share anecdotes and experiences from a 30 year career of exclusive event management. From celebrities, sports personalities to blue-chip businesses and Royal guests…she has worked with them all! Liz was delighted to have been asked by Daniel Skermer (Park Regis Birmingham) to present to the Birmingham PA Forum – an exciting and talented group of the city’s best PAs/EAs. The Birmingham PA Forum was launched earlier this year and is the only organisation aimed at Personal and Executive Assistants in the city – and is supported by the Greater Birmingham Chamber of Commerce. The Liz Taylor Forum meeting takes place at Park Regis Birmingham on Wednesday 6th September between 12.30 ad 2.30pm, and includes lunch. Manchester has been transformed in the last ten years, with a wealth of fine places to dine and ‘celebrity’ chefs in residence. Not every corporate event you plan requires the scale of a Victoria Warehouse or the historic grandeur of The Midland Hotel though. Importantly, some are designed specifically to be more intimate in scale. An exclusive Chairman’s dinner, client cultivation evening or a way of thanking staff or suppliers. Smaller perhaps, but still demanding that every detail is catered for and that a little fun and excitement is on your menu. Whatever and whenever your occasion, our list of Manchester’s five most exclusive private dining rooms is a great place to start your planning. 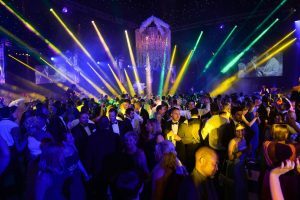 Whether you’re a corporate event organiser in Manchester or organising an exclusive gathering for family and friends, this versatile space caters for all tastes. 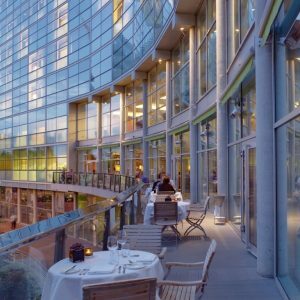 Benefiting from both a central city location and a relaxed river view, The Lowry Hotel is a popular choice for a wide range of luxury events. Its private dining area, you can entertain 24 guests and if you book this space, it also includes private access to The Library, as well as access to the top end of The Terrace for pre- or post-event drinks. If you’re looking to add cultural elegance to your gathering, look no further than the Baronial Dining Room at Chethams. It is one of the best-preserved examples of a 15th century hall. Chetham’s medieval buildings were built in 1421 as a college for the priests of St Mary’s Parish Church, now Manchester Cathedral. It now houses the Chetham’s School of Music and Chetham’s library – the oldest public library in the English-speaking world. You can dine up to 48 guests in The Baronial Hall, which also has its own kitchen. T he Dining Room is now opened into a striking space, with views through leaded windows towards the contrasting New School Building. It provides an ideal setting for meetings, dining, or breakouts from larger events. Smaller rooms in the medieval building are also available. History and hearty British fare are a winning mix in the Albert Square Chop House. Importantly, it’s located right at the heart of the city centre in the corner of Albert Square. This 19th century building, Manchester’s Memorial Hall, pre-dates Manchester Town Hall. It is one of the finest examples of Venetian Gothic Revival architecture in the country. The private dining room, The Thomas Worthington Boardroom, is located on the first floor. 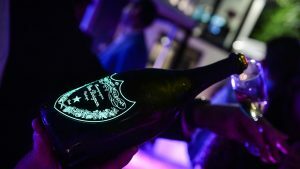 In addition, it caters for up to 18 guests and has private access, lift facilities, exclusive bar, sommelier and butler service. If you’re looking for a modern, urban feel that still gives a sense of Manchester’s industrial heritage, think Artisan Restaurant & Bar. 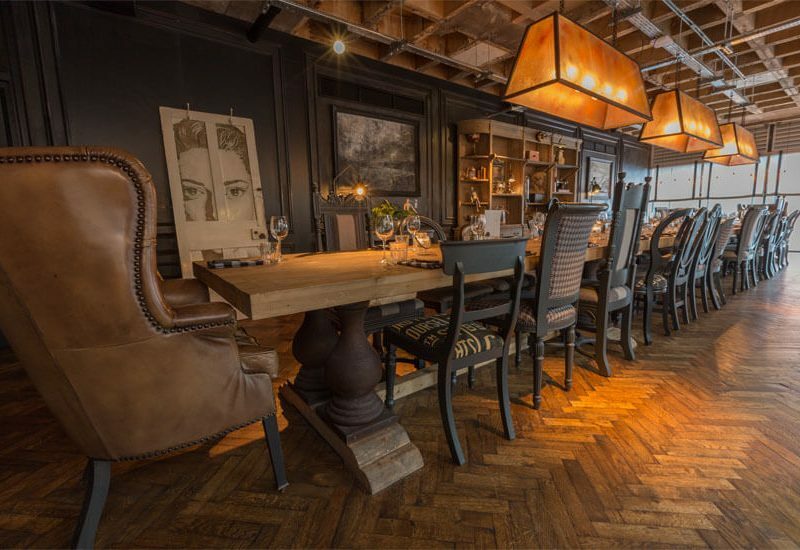 Located in the city’s buzzing Spinningfields area, it offers a choice of private dining experiences. 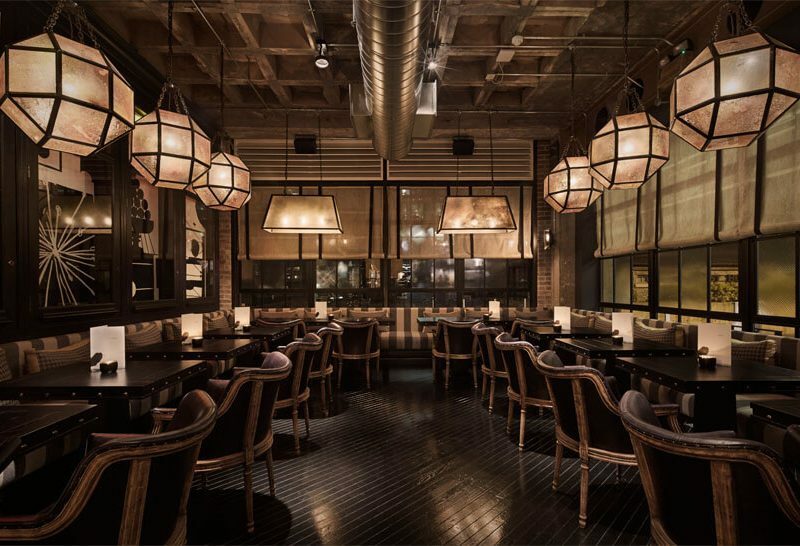 Its spacious 12,000 square foot interior, on The Avenue North, includes three private dining spaces. The grandest of these is The Gallery, which seats up to 36 and adjoins the neon lounge area via bridge walkway. 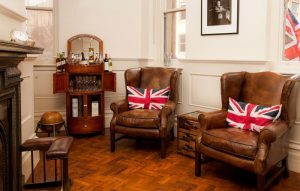 The Drawing Room, is slightly smaller, where you can seat up to 30, but is a popular choice in the summer as it offers both indoor and outdoor café-style seating. You to play your own music through the PA systems in the rooms. The Studio is the smallest of the spaces, and offers an intimate space where you can host 26 guests behind glass screen doors. Therefore – lots of interesting options here! Celebrity Chef, James Martin won Manchester a place in the top Sunday Times Top 100 Restaurants in Britain for 2015-16. His focus on local produce on his seasonally changing à la carte menu and an onsite ‘meat market’ – a huge walk-in fridge displaying the different cuts of local meat maturing, before being cut and served, were a winning combination. Located just off Deansgate, in the Great Northern Warehouse, this 170-seat restaurant takes up the mezzanine level of Manchester235 Casino. Your event can benefit from the venue’s 6am drink licence. For large parties the full restaurant is available for hire. In addition, if you are looking for a more intimate gathering you can book the chef’s table for up to 10 guests. Sectioned off from the rest of the diners with the option to create a bespoke menu which will be served by chef, Doug Crampton and head sommelier. 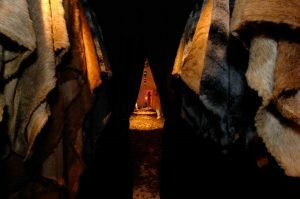 It was a challenge to stick to a list of Manchester’s five most exclusive private dining rooms. In reality, there are many more gorgeous, quirky and unusual dining rooms on offer. 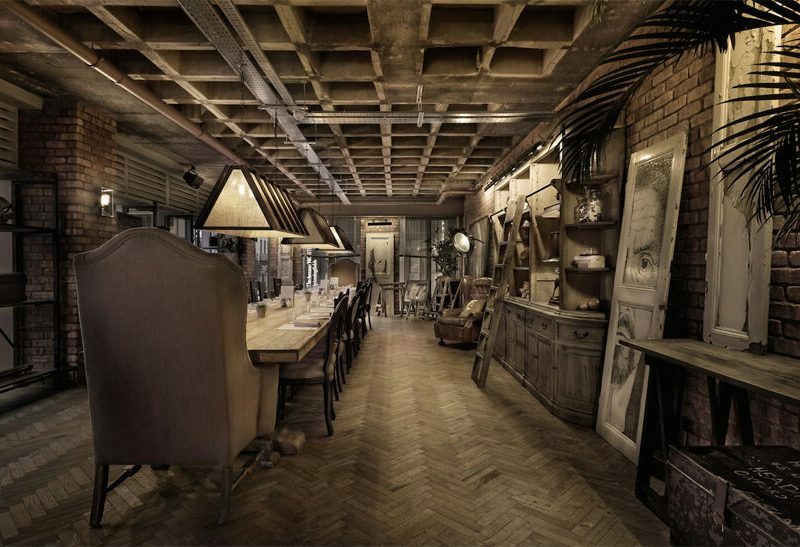 Hence I could easily have written a list of Manchester’s ten most exclusive private dining rooms….but that is for a sequel!!! Finally, it is always key to the success of any event that the right venue is chosen. Consider the audience, accessibility and service – as with any larger event. Boutique in scale does not mean less in standards! A book of our childhood – and latterly a blockbuster movie series – the wintry landscape of Narnia (from the Lion, the Witch and the Wardrobe) is popular festive backdrop. Entering through the wardrobe. Changing from autumn to frozen winter. Icy landscapes set against a background of cool blue and hot pink light production. Clear Perspex tables. Clear crystal candle sticks. Frosted fruits, twigs and pinecones. 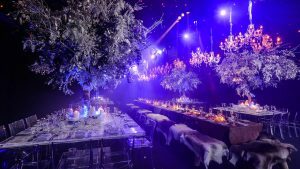 In addition, an icy dancefloor sits under the chandelier of delicate frosted twigs. Bring a warm coat……. Dramatic lighting production of pink, blue and green puts wooden bench tables under the spotlight. Faux fur throws add warmth to rustic seating. Tables lined with white frosted branches, ferns and pinecones. Giant frosted trees provide height and mingle amongst the crystal chandeliers. In addition, chunky white candles sit inside clear storm jars and atop of Perspex tables filled with snow! Walls and ceiling washed with blue and falling snowflakes. Long tables dressed with black linens nestle next to silver chairs. Tall silver candlesticks entwined with fresh foliage. Pinecones, green ferns, clear glass beads and delicate cream roses work perfectly with the chunky cream candles. Add to this silver tableware and clear crystal glasses with rims of silver. A truly stylish banquet. 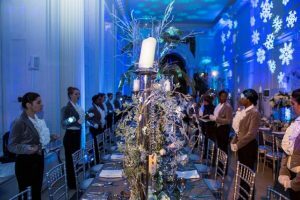 Importantly, the key to making these three winter celebrations work is that whilst they capture much of what is traditional at Christmas – snow, frost, ice, pinecones….they are all presented in a much more contemporary, inventive manner. What’s more, even Rudolph can be included…our giant silver reindeer is a talking point at any Christmas party! Secure the best venue There’s nothing worse than trying to book a party only to find out that the venue you’d set your heart on is already booked. The best venues are always busy and December particularly so. Starting your planning a few months ahead gives you time to research a few venues, ask for what you want, and secure a venue that has everything you need. 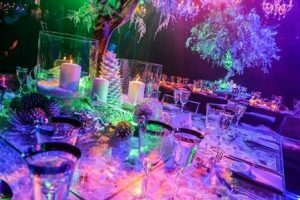 Getting your venue booked early also gives more time for fun parts of planning, like deciding on a theme. 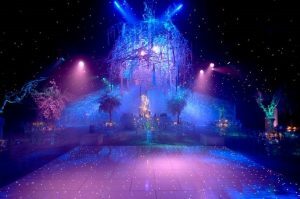 A Las Vegas theme, masquerade ball, fun fair ground, or a fairy-tale Winter Wonderland always go down a treat at this time of year. Getting a date in the calendar early is important to make sure you can plan work around it, particularly if you want staff to have an early finish to prepare for the party or a day off the following day. 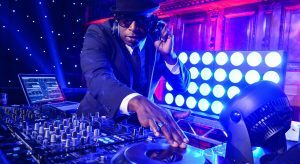 Venues and entertainers like to plan ahead too, which is why they will often offer discounts or special packages for early booking. Christmas can be a heavy time for people financially. If staff are contributing, asking for an early deposit and a small amount of money each week can help to spread the cost. This way when December comes there is nothing left to pay and the party feels like a genuine treat. Make sure that when you invite staff you’re clear what is and isn’t included so that there are no hidden costs. It’s good to be the first date in the festive calendar because you’re likely to get a better turn out as people plan the rest of their celebrations around it. Being ahead of the game also gives you an opportunity to build-up a buzz around the event. Rather than chasing your tail on the basics, you can spend time creating excitement through social media and in-house promotional activities. 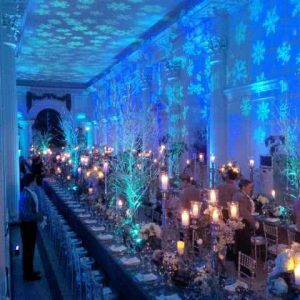 Choosing a date, booking the venue and entertainment are the three main elements of Christmas party planning. The sooner you do this the better. It not only means less time wasted ringing round venues only to find they are fully booked, it also means less stress for you. Having the main planning sorted takes a lot of the pressure off so you can spend the run up to the event focussing on fun details that will help your party stand out and be the event people are still talking about, for all the right reasons, next summer when the time comes to start planning the next one.